It is clear that Online Communities are a growing research method. If we are to believe Leonard Murphy, they are the top emerging method in market research. But, what are communities exactly. It is not an idle question, as I was reminded this week when I was asked to explain them to a marketing manager who had never used them. What is the relationship between an MROC and the common understanding of the word community? How does an MROC differ from a community that extends over a long period of time? How is a community created for a specific research objective unlike the community of loyalists created by a brand? There are many ways to answer these questions, some theoretical and others highly pragmatic. 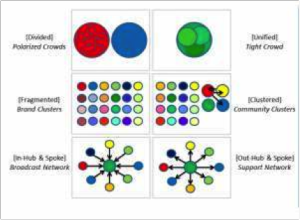 However, the Pew Research Center and the Social Media Research Foundation have just released an extremely interesting and relevant report: Mapping Twitter Topic Networks: From Polarized Crowds to Community Clusters. It can provide a sound footing for all discussions of communities by providing us with a typology. The table below is a simplified graphical representation of these six networks. One thing strikes me about the typology, particularly as a practitioner of MROCs and focus groups. When I explain the benefits of on-line communities or focus groups, I almost always stress the synergy the can develop among the participants as they share experiences and ask each other questions. The result should always be more insights than I would gather from each individual taken separately. At least that is the ideal, the hope. Yet, an online community or focus group often resembles a Brand Cluster, Twitter networks that form around "well-known products or services or popular subjects like celebrities." That's because so much research is driven by the need to optimize our understanding of brands. These networks have a large number of disconnected participants. In other words, brands draw participants who tweet about the brand, but they do not converse with each other. This is not the network we want in a focus group or online community. Tight Crowds are what we want. These are discussions among many participants who are very interconnected. Members seek out and share information with each other. These Twitter networks form around professional topics or hobbies, things about which the members care about and things which derive their meaning and value from the relationships among the members. These communities exist to share by their very nature. If we are to maximize the synergy within our online communities and focus groups, we need to ensure that they resemble Tight Crowds more than Brand Clusters. We can do this by bringing the communities or groups together to focus on the categories and behaviors about which the members are passionate. For example, we are much more likely to gather insight that will help us position a brand of flour by talking about the home and baking than we are talking about the brand itself, even if we use the most clever projective techniques. To make our groups and online communities as successful as possible, we need to recognize the topics that stimulate the most productive synergies.